Killer Tomatoes Strike Back! (1991) - Sci-fi-central.com. USA  1991  87m   Directed by: John De Bello.  Starring: Debi Fares, Rick Rockwell, John Witherspoon, John Astin, Crystal Carson, J. Stephen Peace, Steve Lundquist, Zollo Cortez, John De Bello, Thomas W. Ashworth, Cal Worthington, Robin Abb, Lane Post.  Music by: Neal Fox, Rick Patterson. Police detective Boyle along with beautiful tomato scientist Kennedi Johnson are investigating suspicious deaths. Johnson believes it's killer tomatoes but Boyle dismisses her. 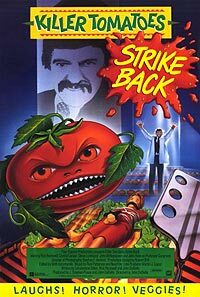 Professor Gangreen (John Astin) is disguised as outrageous TV talk show host Jeronahew to brainwash the people and enslave the world with his killer tomatoes. Johnson is attacked by a tomato but Boyle refuses to believe. Boyle is a horribly stupid character and not in the funny way. He is annoying and the actor is not funny. He is so unfunny that he actually subtracts from the others. Johnson's fake screaming is an almost funny gag. John Astin could have worked in a better movie. I just can't stand Boyle. There is a small chance that some people will find this to be so bad that it becomes good. from the Internet Movie Database.